Human and Person’s relationship is more than just Sun sign compatibility of Virgo and Aries. No individual is a pure Virgo or Aries but instead is a unique combination of signs and planets. The following interpretation defines the synastry or interplanetary aspects between the planets in Person’s birth chart and the planets in Human’s birth chart. There is no evil planet in the combinations. No single combination can make or break the relationship. The list goes from the most harmonious (positive) to the most discordant (negative). Person’s Sun Trines Human’s Pluto (+8.48 harmony) – Person’s sense of identity, ego, will, and character combine very effortlessly with Human’s sense of transformation, change, or power and destiny. Person can bring out the psychoanalyst in Human. There is harmony in the relationship that helps each other grow as individuals. It stimulates enterprise and ambition in both Human and Person. There is mutual interest in magical and occult knowledge. The positive effect of this influence can lead Person and Human to a long-term relationship. Person’s Sun Sextiles Human’s Uranus (+7.85 harmony) – Person’s sense of identity, ego, will, and character combine pleasantly with Human’s sense of independence, freedom, and originality. There is a sense of mutual liberty that stimulates the relationship. Both Person and Human have the willingness to try out new ideas. Both are highly creative together and are open to an intelligent conversation. Sharing idiosyncrasies together is a fun experience for Human and Person. Person’s Jupiter Sextiles Human’s Uranus (+6.24 harmony) – Person’s sense of growth, expansion, or generosity combines pleasantly with Human’s sense of independence, freedom, and originality. Person’s visions stimulate Human’s creative genius. Person will expand Human’s goals and creativity. Human adds innovation and excitement to Person’s projects. Freedom and self-expression are the primary focus of the relationship. Person’s Uranus Sextiles Human’s Uranus (+5.93 harmony) – The individual sense of independence, freedom, and originality combine pleasantly with the couple. Person and Human stimulate each other’s strange ideas. There is a feeling of openness. Both enjoy their own craziness. The relationship encourages one another to have a broader view of the changes affecting society in general. Person’s Mercury Trines Human’s Pluto (+4.28 harmony) – Person’s mentality and powers of perception combine very effortlessly with Human’s sense of transformation, change, or power and destiny. There is harmony in how each other influence the other’s mind. There are depth and wisdom in the relationship. Human encourages Person to think more deeply. When both Person and Human combine their minds, they can build their exciting ideas into a giant success. Person’s Venus Trines Human’s Venus (+4.01 harmony) – The individual sense of sexuality, attraction, or intimacy combines very comfortably with the couple. There is harmony in the way each other expresses affection. Social, cultural, and financial interests are the same. Both enjoy the same pleasures in life. Person and Human have the desire to help and encourage each other. The relationship is a romantic attraction. Person’s Mercury Sextiles Human’s Uranus (+3.65 harmony) – Person’s mentality and powers of perception combine pleasantly with Human’s sense of independence, freedom, and originality. Both stimulate the intellectual and mental awakening in each other. Person and Human bring out each other’s innate genius and encourage its development. The relationship generates tremendous creativity. Communication flows smoothly. Both enjoy the frequent exchange of challenging ideas. Person’s Mercury Trines Human’s Mars (+3.05 harmony) – Person’s mentality and powers of perception combine very effortlessly with Human’s sexual drive, temper, and powers of self-assertion. There is harmony in the exchange of ideas and self-expression between each other. The relationship inspires a lively and productive conversation. Person’s thoughts and opinions are set in motion by Human’s encouragement. Person’s Mars Trines Human’s Mars (+2.94 harmony) – The individual sexual drive, temper, and powers of self-assertion combine very comfortably between the couple. There is harmony in the desires and dreams of Person and Human. The relationship is encouraging to achieve each other’s goals and ambitions. Human and Person are incredibly attracted to each other and are sexually compatible. Human’s Saturn Trines Person’s Neptune (+2.42 harmony) – Human’s sense of commitment, necessity, or duty combines very effortlessly with Person’s sense of spirituality, imagination, or mystical inclination. Human’s practical instincts are in harmony with Person’s visions and dreams. Human has a good sense of reality that Person might not have. Person is aware of a different dimension that can help Human. Person’s Jupiter Conjuncts Human’s Pluto (+2.39 harmony) – Person’s sense of growth, expansion, or generosity combines with Human’s sense of transformation, change, or power and destiny. Human can be possessive and domineering. Person will inspire and encourage Human. The combination can either be in harmony or discord depending on other aspects. This aspect helps deepen the connection between Person and Human. Human’s Mars Trines Person’s Neptune (+0.09 harmony) – Human’s sexual drive, temper, and powers of self-assertion combine very effortlessly with Person’s sense of spirituality, imagination, or mystical inclination. There is harmony in the equal exchange of sympathy and compassion. Human helps Person fight procrastination. Person inspires Human to more significant achievements. Person’s Uranus Conjuncts Human’s Pluto (neutral) – Person’s sense of independence, freedom, and originality may combine or resist with Human’s sense of transformation, change, or power and destiny. The intensity will depend on other factors of the relationship. This is favorable if Person and Human have more aspects in harmony than in discord. Person’s Venus Conjuncts Human’s Saturn (-0.25 discord) – Person’s sense of sexuality, attraction, or intimacy combines with Human’s sense of commitment, necessity, or duty. Both will show love through practical means and material accomplishment. Human provides the mental, emotional, and financial stability in the relationship. Person’s sympathy and affection stimulate Human’s confidence. Human can become possessive of Person. Person can feel restricted by Human’s criticism and discipline. Person’s Venus Squares Human’s Mars (-2.03 discord) – Person’s sense of sexuality, attraction, or intimacy interacts stressfully with Human’s sexual drive, temper, and powers of self-assertion. There is a strong sexual attraction between Person and Human in the early stage of the relationship. Too much stimulation causes friction and disputes. Human feels suffocated by Person’s possessiveness. Person can be deeply hurt by Human’s thoughtless words. Person’s Sun Opposes Human’s Mercury (-4.09 discord) – Person’s sense of identity, ego, will, and character confront and challenge Human’s mentality and powers of perception. There is tension in the differing viewpoints and opinions of Person and Human. Communication between Human and Person is difficult. The mental energies of Human are frequently opposed by the creative powers of Person. This aspect is challenging in a long-term relationship like marriage. Person’s Venus Squares Human’s Uranus (-4.27 discord) – Person’s sense of sexuality, attraction, or intimacy interacts stressfully with Human’s sense of independence, freedom, and originality. Occasional disappointments in each other can cause friction and temporary separations. Both may be fickle toward each other and cannot depend on one another. The relationship has an erratic, unstable, but intoxicating quality. Person’s Saturn Squares Human’s Uranus (-5.52 discord) – Person’s sense of commitment, necessity, or duty interacts stressfully with Human’s sense of independence, freedom, and originality. There is friction in the conservative principles of Person and the progressive nature of Human. Person will restrict Human’s progress and expression of individuality. Human will rebel against the traditional and controlling character of Person. 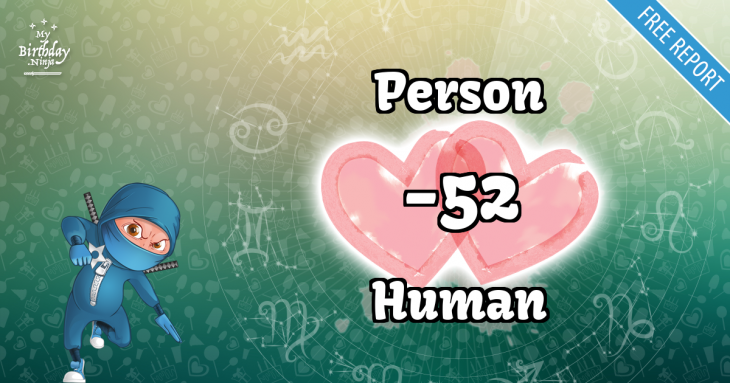 Person’s Sun Opposes Human’s Sun (-6.04 discord) – The individual sense of identity, ego, will, and character confront and challenge each other. The different temperaments of Person and Human can either cause tension or complement each other. Both can be attracted or repelled by the difference in perspective on life by the other. Human’s Sun Squares Person’s Neptune (-6.97 discord) – Human’s sense of identity, ego, will, and character interact stressfully with Person’s sense of spirituality, imagination, or mystical inclination. The friction between Human and Person can cause misunderstanding, doubt, confusion, distrust, deception, and sometimes infidelity. There is a lack of trust in the relationship. Person can be elusive, misleading, or even deceptive towards Human. Human’s Mercury Squares Person’s Neptune (-7.08 discord) – Human’s mentality and powers of perception interact stressfully with Person’s sense of spirituality, imagination, or mystical inclination. Person’s indulgence in random thoughts can cause confusion in Human’s method of thinking. Both Human and Person are capable of lying to each other. Person’s willful dishonesty can lead to misunderstanding and friction in the relationship. One or both may keep secrets about past relationships as a method of self-preservation. Person’s Mars Squares Human’s Neptune (-7.49 discord) – Person’s sexual drive, temper, and powers of self-assertion interact stressfully with Human’s sense of spirituality, imagination, or mystical inclination. There is friction in Human’s elusive reaction to Person’s unexpected behavior. The relationship can cause emotional disturbance and extravagance in one or both. Human’s Neptune Squares Person’s Pluto (-9.20 discord) – Human’s mystical or spiritual inclination interacts stressfully with Person’s sense of transformation, change, or power and destiny. There is friction in the religious or philosophical beliefs of Human and Person. Person will likely have a more forceful personality that Human. Human attempts to give Person spiritual advice about the personal or psychological journey. Person in return will psychoanalyze Human’s religious or philosophical beliefs. Person’s Saturn Squares Human’s Neptune (-10.08 discord) – Person’s sense of commitment, necessity, or duty interacts stressfully with Human’s sense of spirituality, imagination, or mystical inclination. There is friction in Person’s realism and Human’s idealism. Person’s Mars Conjuncts Human’s Saturn (-11.72 discord) – Person’s sexual drive, temper, and powers of self-assertion can combine with Human’s sense of commitment, necessity, or duty. The relationship induces cooperation and working for a common goal. Both either complement each other well or antagonize each other’s differences. Person stimulates the ambition and progressive instinct in Human. Human in some ways restricts or limits the activities of Person. Human’s Saturn Opposes Person’s Pluto (-12.44 discord) – Human’s sense of commitment, necessity, or duty confronts and challenges Person’s sense of transformation, change, or power and destiny. There is tension in the relationship when Human and Person compete for influence and dominance. Person may try to reform Human’s strict and severe attitudes toward life. Human’s conservative opinion weakens the inner energy of Person. Person’s Saturn Opposes Human’s Saturn (-33.70 discord) – The individual sense of commitment, necessity, or duty confronts and challenges each other. There is tension in the relationship between how the couple handles responsibility and security. Person and Human mistrust each other that it can create severe problems of adjustment. There are 2 mutual receptions in Person and Human’s planet combinations. Planets in mutual reception enhance each other. This will add +20 harmony to the total score. The remaining -2.45 discord is due to some minor aspects or planets in parallel.